University College London Bartlett’s International series of open lectures covers a wide range of ideas in architecture, design, technology, history and theory. The series totals some 25 lectures in a typical year and ranges from such personalities in the architectural world as Bernard Tschumi, Zaha Hadid or Daniel Libeskind, to the first public lectures by talented newcomers. It also includes lectures from young and established scientists, engineers and makers looking at the ways in which architectural worlds are conceived, made and subsequently perceived by others. Also addressed are a wide range of issues concerning related disciplines such as art and art theory, philosophy and critical theory, urban geography, cultural studies, journalism and criticism, with speakers such as Alain de Botton, Jean Baudrillard, Patrick Keiller and Mark Wigley. ORTLOS Space Engineering is an immersive spaces design studio which develops innovative environments as a new channel for engaging with communities and building spatial experiences. The studio translates 21st century technologies into spatial systems and strategies – packing the ideas und visions into architecture. 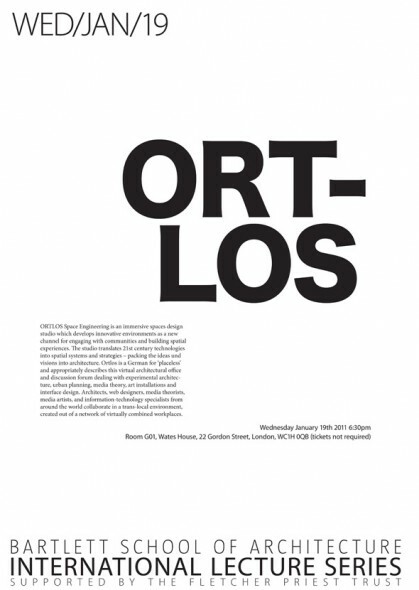 Ortlos is a German for ‘placeless’ and appropriately describes this virtual architectural office and discussion forum dealing with experimental architecture, urban planning, media theory, art installations and interface design. Architects, web designers, media theorists, media artists, and information-technology specialists from around the world collaborate in a trans-local environment, created out of a network of virtually combined workplaces.